Spaghetti… and immediately a flavour of Italy occurs to everybody. The most famous pasta in the world, with its thousand tasty versions, has some champions, too. 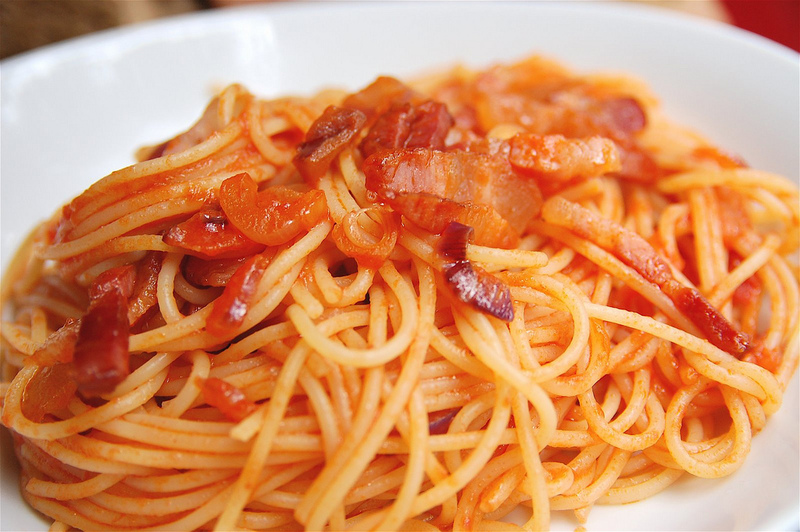 This happens as for ‘spaghetti all’amatriciana’, a concentrate of authentic Italian flavours. From the heart of the Appennines, in the province of Rieti, a recipe that tells about the rural excellences of this land: spaghetti, lard from the pig’s cheek, dry white wine, hot pepper, pecorino cheese, and, of course, tomato that comes from the whole region. The tradition of spaghetti is linked to the presence of some of the most ancient pasta factories of Italy, that, thanks to richness in water of this land, manufactured pasta for the nearby capital city, Rome. The lard from the pig’s cheek, tasty heart of this dish, is considered as the most delicious one, because it is crossed by little muscles that make it lighter, but more scented, too. The dry white wine usually used is the DOC one coming from Sabina hills, in the province of Rieti. The purists of this recipe consider this straw-yellow wine, very dry, but absolutely harmonious, as irreplaceable. Pecorino cheese is the very clear one coming from Monti della Laga, in Central Italy, that surround Amatrice in a panoramic and geographic hug that protects this tableland against pollution and mass tourism. Sheep milk mixed with goat milk, at the most up to 30%, with a fat consistency and a salt and spicy flavour. The hot pepper of this land boasts a century-old tradition that, beginning from Colombo, used it in these mountain countries as a preservative instead of the more expensive salt. Both typicality and quality guarantee of these products is preserved with a care and sense of common good for which the local producers accepted very enthusiastically the controls for the certifications. Amatrice has other excellences: ‘Marotta’, the mortadella with very fine grain made with pig’s flesh only, with a central lardon. When it has been prepared, it is inserted in two hazel sticks in order to press it. Spelt of one of the most ancient variety of Mediterranean Sea and apples with a persisting scent, organically produced, too, are some other appreciated products. The organic production in this land became consolidated during the past 20 years, because of the missed coming of intensive farming. During the last few years, the production of mountain ‘millefiori’ honey sweetly added to the basket of flavours of this land. This honey, too, is unique, thanks to the brown veins of its colour, flavour and scent, due to the incursions of bees in the chestnut woods. These natural local products are appreciated all over the world. 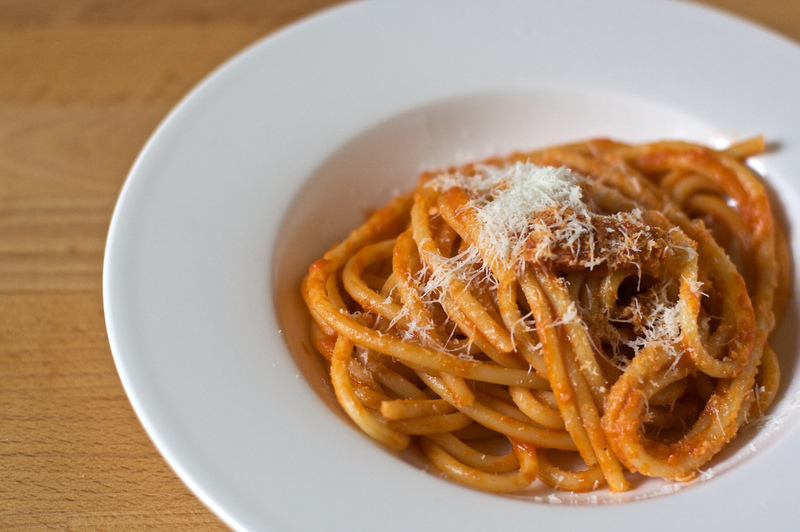 At the gates of the National Park of Gran Sasso, on a tableland situated at almost 1000 metres, there is Amatrice, the village that exported ‘spaghetti all’amatriciana’ all over the world. Either red with tomato or white spaghetti all’amatriciana is the ill-concealed excuse for proposing the excellence of this land, too. Even if it is isolated, thanks to its location on the ancient ‘Via Salaria’, vicinity of Rome, and winter touristic pole of Gran Sasso, it takes advantage of its context for producing excellences with neither cultural nor environmental contaminations. This recipe is considered as a national treasure, so that a stamp was dedicated to the ingredients of spaghetti all’amatriciana. It is polychromatic and perforated, its value is € 0.60 and was issued by Italian Republic. All the products that come from this land propose themselves in a simple and real way, because they want to be the leading actors. The strong and proud reference to Amatrice and Italy on both labels and presentations counterbalances this simplicity. This local pride is always evoked in the packagings of pasta produced in Latium, too, where the symbols of this region are very highlighted.